Now, if you’ve never heard of steampunk before and have no idea what it is, here’s a quick overview to make sure you’re up to date. Steampunk is a style that is a mixture of an industrial, modern and old-fashioned style. The theme came from a subgenre of science-fiction and is actually described as an alternative history in the 19th century. The simple answer to this question is no. Steampunk isn’t dead, it’s still going strong today. It is still a niche genre though, but in a way, I think that’s what gives it its charm. So now that you’ve been caught up to date, you may find yourself being interested in a steampunk designed home. If you’re wondering if you have the characteristics to be steampunk, of course you do! Steampunk is a genre, so there aren’t any set characteristics needed. A love for science-fiction and crafts will be sure to lend a helping hand though! To have a steampunk style house could definitely be quite a challenge, but a rewarding one at that! For the exterior of your home, having brick walls is definitely a plus! But personally, I think the exterior isn’t as important as the interior. Here are a few tips on how you can give your home a steampunk touch! The interior of your home will definitely be the best place to start when creating a steampunk home, but what exactly are you looking for? I’d say the best place to start is an individual room, think small before you think big. Here are some tips on individual rooms that you might want to give a steampunk theme too. Don’t be scared of metal, having some metal furniture in your bedroom will add a different texture and add to the steampunk aura. Other rooms should follow a similar theme to the living room, with a few exceptions of course! In your bedroom, you should definitely make it your own, find some old-fashioned decorations that’ll add a personal touch. Perhaps your grandfather had an old top hat, adding that will make your room feel more personal and still add to the steampunk theme. Make sure to add a lot of pictures as well, perhaps even look for some steampunk art to print out and frame on your wall! Maybe even add some dramatic lighting for a more industrial look. The best tips to create a steampunk bathroom would be investing in metal and industrial style furniture, this would fit brilliantly in the bathroom. Try getting different types of metal colours, a contrast of silver and copper colours will create a steampunk theme. Make sure to add small detailing as well, for example getting a steampunk toilet seat. It may seem simple, but you’ll be amazed by the difference it could make! Now, you may think that making an apartment steampunk themed could be quite a challenge, I’d argue the opposite! In an apartment the rooms are more connected, making it a lot easier to spread the theme around your home! So, we’ve discussed a few tips of steampunk decorations and furniture we can use, but what else can we do? For a steampunk theme, I’d definitely say that the colors are very important. The typical color theme can be shown through furniture, for example, a brown leather sofa or a metal cabinet. The rustic and darker colours will certainly add. When painting for a steampunk theme, here’s the best tip I can give. Use spray paint! Spray paint has a variety of metallic colors, and is overall easy to use! Spray painting a few old objects, or new objects, can definitely make them look a lot more steampunk. Make sure to use multiple layers of spray paint, and perhaps try sanding in between layers to roughen it. Apart from the obvious metal colors, what other colors could you use for a steampunk room? A dark red, brown, silver, grey and pastel colours definitely fit the theme. Having contrasting colors will definitely fit the theme. Try combining dark colours with pastel colours! When it comes to storage, there are a lot of options you can choose. Why not invest in some metal and industrial style chests? Another interesting you can use is having a storage trunk as a table, it’ll not only be space efficient but also stylish and original. When decorating your home in a steampunk style, it is possible to end up with clutter. If you don’t have enough room for previous items, you can always just get a storage unit or use somewhere like WhatStorage. That way you can have your steampunk themed home, as well as not getting rid of all of your items. There are actually different variances of a steampunk decor, meaning you can find the style that fits perfectly for you. They all follow the same concept, however, there are similar decors that are similar to steampunk in ways. The two main types are a Victorian style, as well as a Wild West style. There have also been variations that follow a modern steampunk style. The Victorian steampunk decor style is a lot more traditional as it is one of the main original designs. This style follows an alternative history of the old school Victorian era, however, it focuses a lot more on technology. Imagine an old Victorian style house with a retro technology tweak, that’s what Victorian steampunk is like. Similarly to the Victorian style, the wild west steampunk decor is very similar but with tweaks. Instead of following the old British Victorian designs, it instead follows the American Wild West era. This decor should follow the wild west style, whilst incorporating the science-fiction technology ofcourse. Modern steampunk decor is definitely more vague and can have its own interpritations. Personally I see modern steampunk decor as a more polished version of the Victorian and Wild West style. It simple means having less of a rustic style, but still follow the general theme. As well as steampunk, there are also a few different types of decors that are very similar. For example, diselpunk is an option. The most popular contender is cyberpunk whis is similar to steampunk in a variety of ways, but also very different. The biggest difference between the two styles is the time in which they’re set. The steampunk decor sets its alternative timeline in the past, whilst the cyberpunk decor’s theme is set into the future. Though both have an alternative design and feature technology, their concepts are different. Steampunk focuses on an old-fashioned twist to technology, whereas cyberpunk focuses on an advanced technology design. Colour wise, steampunk is assosiated with darker and rustic colours. Meanwhile, cyberpunks dystopian future design features bright and neon colours. The colouring is definitely a huge part on the differences. Here is an example of a steampunk bedroom. As you can see, the colours are quite rustic and tame. The decorations also look quite rusty and certainly old-fashioned. On the contrast to the steampunk design, here’s an example of a cyberpunk bedroom. As you can see, it’s also very unique and pretty clustered. However, this style features brighter colours and more advanced technology. Should You Have A Steampunk Interior? Overall, the choice is yours! The steampunk design is definitely a stylish one, but it might not be for everyone! 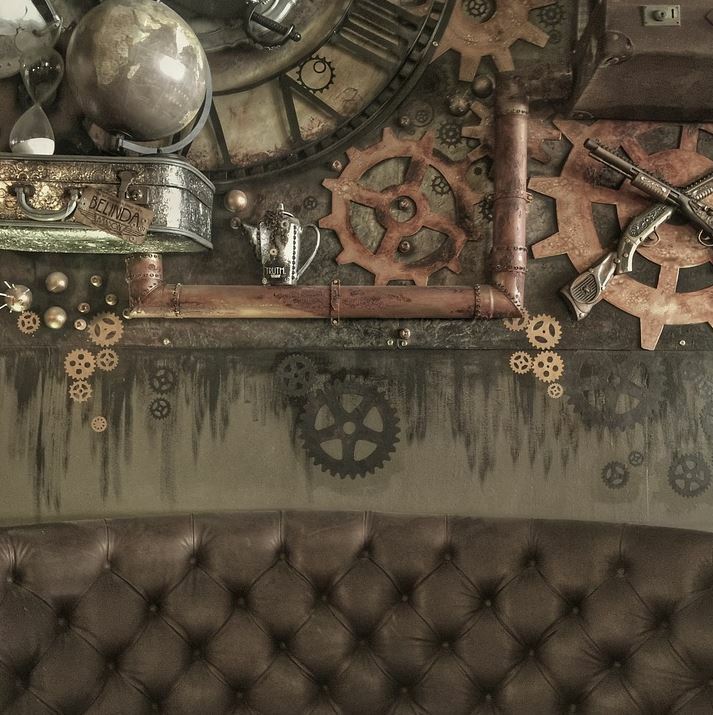 If you are looking to create a steampunk interior, I hope this blog has given you a few helping tips or maybe pushed you towards hiring an interior designer!